Experts bring mummified monkey back to life by using miraculous new technique. 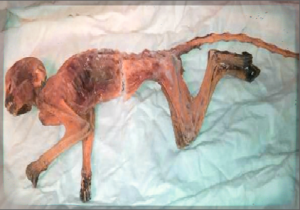 Dayton, OH – After discovering a mummified monkey in an old department store’s duct work, a team of mummiologists was called in to see if anything could be done to save the mortalized monkey. Jo-Jo is now enjoying some banana soup after 50 years of mummification. Ironically, all the letters in Odem Kenady can be resuscitated to spell: Dead Monkey!